Putting your thoughts and personal opinions on paper, or in this case online, for anyone to read, will always be a gamble. The simple fact is not everyone is going to agree with you, but that's ok.
How boring of an existence if we all thought and acted the same? Politics, sports, fashion, music, comedy, we all have different tastes. I love Will Ferrell. I have friends who don't think he's funny. What do they know? I like Heavy Metal and I loathe New Country, but what do I know? Movie reviews, not interested. Fashion sense, I have none. However I do like the look of a well tailored suit. Recently the Seattle Seahawks released two of my favorite players, Michael Bennett and Richard Sherman. Michael left town with barely a whisper. Signed by the Philadelphia Eagles, some will simply say, "He's their headache now". Michael was an outspoken individual and his time in Seattle was not without controversy. He missed training camp while hoping to renegotiate his contract, protested racial injustice by refusing to stand for the Nation Anthem and most recently, after an incident at a nightclub, accused Las Vegas Police of racial profiling. Many are glad he is gone. Richard was an original member of the Legion of Boom. A 5th round draft pick, #25 for your Seahawks was also outspoken, provocative, at times too cocky for me, but one heck of a Lockdown Corner. The two of them are a big part of why we as Seahawk fans enjoyed a 43 - 8 blowout of the Denver Broncos in Super Bowl XLVIII and why if you're a football fan, for the past seven years have looked forward to Sundays with great anticipation. Who among us doesn't recall the lean years of Seahawk Football. I'll admit that at times I was uninterested in watching what would inevitably end up being one for the "loss" column. For many years the Seahawks lacked personality or at least the type of "personalities" needed to win football games. We were the nice guys of the AFC. We had The Boz ... yawwwn. We had Rick Mirer ... who? We also had Zorn to Largent, who by the way are still nice guys. But the teams who won Championships had Jack Lambert (Steelers), Randy White (Cowboys), Bill Romanowski (49'ers), all considered to be mean and sometimes dirty players. In 1999 the Seahawks hired 3x Super Bowl winning coach Mike Holmgren and things quickly started to take shape. Then a few years after being cheated, yes I said cheated, out of Super Bowl XL, Pete Carroll was hired. No stranger to controversy himself, he and GM John Schneider set about drafting what would soon become one of the most dominating Defenses in the NFL and the 12's went nuts! So many tense moments, so many great games, Sports Illustrated cover stories, national headlines, Blue Fridays, Seahawk tattoos, I even know a guy who purchased his own Super Bowl ring. Seattle was once again on the map and whom for that can we thank? In this writer's opinion, Michael Bennett, Richard Sherman, Kam Chancellor, Cliff Avril, of course Russell Wilson and a whole host of other Hawks. So it bothers me when I see negative comments hurled at players like Richard who have been "let go" by their employer only to be offered contracts soon after by the competition. I'm certain Richard Sherman is grateful for the opportunity to play football for the 12's. I'm positive he would have preferred to end his career where it all started and I would imagine his comments about "sticking it" to the Seahawks probably wouldn't have been made had those fans who are bitter not taken his decision to move on so personally. The casual onlooker forgets all to quickly that professional football is a business. 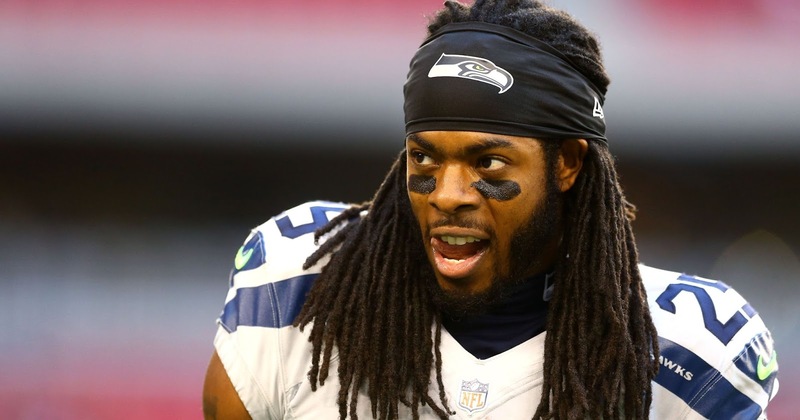 As a savvy businessman I'm confident Mr. Sherman has set himself up financially and probably doesn't need to collect another paycheck for the rest of his life. After all, he graduated from Stanford. But who among us would turn down 40 million dollars to play a game we love? As in radio (my profession for the past 27 years) changes are made quite often. Sometimes immediately after being named "Denver's Best DJ". Radio, too, is a business and after being fired from a station for whom I'd worked diligently for several years, the local newspaper asked me why I took a job the very next day with the competition "across the street"? My reply; "My wife has this nasty habit of needing to eat"
Thank you Richard, good luck and Go Hawks!